Women are each other's human wonder bras - uplifting, supportive and making each other look bigger and better. The wit and wisdom of Girl Talk will not only offer some pun-in-cheek female solidarity but will also help readers achieve a black belt in tongue fu. 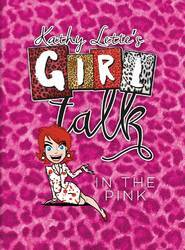 Girl Talk - In The Pink, takes a humorous look at the many stages of womanhood through cartoons from Kathy Lette, the well-known queen of one line quips.